I was compensated for this review of Papa Murphy’s and their #Team425 Sweepstakes – Vote for your favorite pizza bracket competition. All opinions and statements remain 100% my own. I will only endorse companies, products and services that I believe, based on my own experiences, are worthy of endorsement. If there’s one thing my family loves, it’s pizza. One of our favorite places to get pizza is Papa Murphy’s. And sitting around our dining room table as a family eating a fresh, delicious Papa Murphy’s pizza is a special time for us. We are making great memories enjoying our favorite pizza. Right now you can vote for your favorite pizza in the Papa Murphy’s Take ‘n’ Bake Pizza Bracket Sweepstakes. The bracket competition started with 16 pizzas to choose from then narrowed down to 8 pizza favorites. I voted yesterday and 3 of my 4 picks moved on today. It was extremely easy for me to cast my votes. It also got me craving pizza. Two of the pizza choices sounded so good that I stopped by one of my local Papa Murphy’s and picked them up over the weekend. 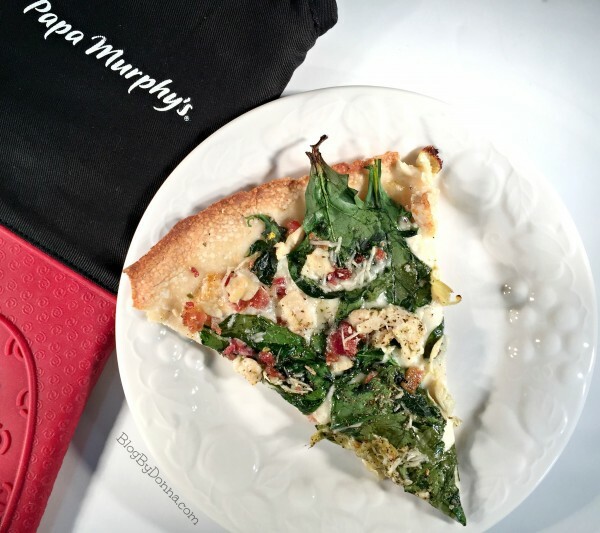 It’s so easy to get a fresh Take and Bake pizza from Papa Murphy’s, you can even order online from Papa Murphy’s website… a very convenient way to get a pizza for busy moms like me. I happened to be out running errands so I just stopped in and got a Chicken Bacon Artichoke pizza and a 5 Meat Stuffed pizza. The 5 Meat Stuffed pizza has made it to the last four pizzas standing, and I can tell you it is a hearty and delicious pizza. We thoroughly enjoyed it. 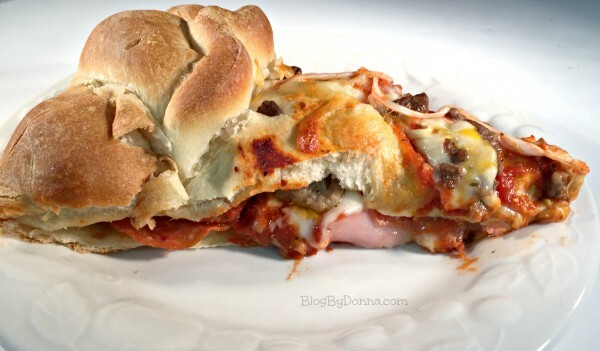 Look at all the delicious meats stuffed inside that beautiful dough… it’s a wonderful thing. I also got the Chicken Bacon Artichoke pizza. Okay, it did lose to the 5 Meat Stuffed pizza, but we actually liked the Chicken Bacon Artichoke better. Seriously, this pizza is amazing! 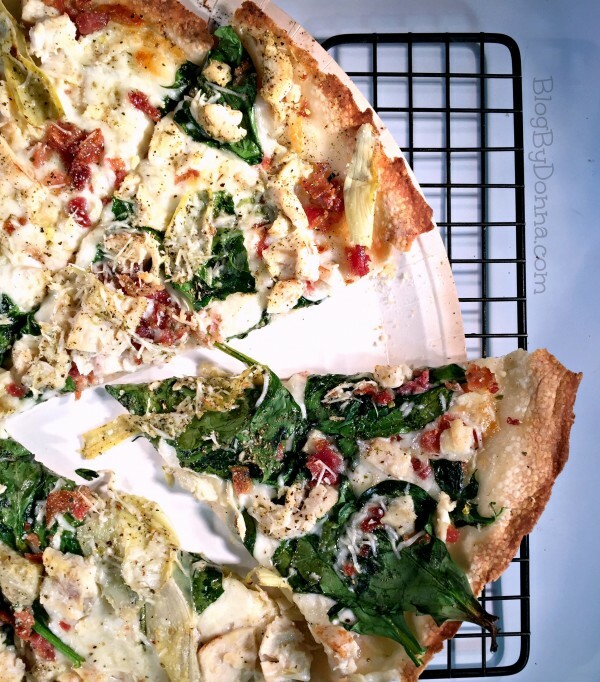 It’s got a crispy thin crust and the saltiness of the artichoke hearts lends beautifully with the chicken, bacon, spinach and creamy garlic sauce. Yum! Don’t get me wrong, the 5 meat stuffed deserves to win and I must say the perfect pizza for a basketball viewing party, but my family’s personal favorite pizza is the chicken bacon artichoke. I encourage you to vote for your favorite pizza in the sweepstakes, too. There will be five lucky winners who receive pizza for a year (a $1000 value)! What an awesome giveaway! Any votes automatically enters you in the sweeps — the pizzas you vote on do not have to advance or be the winner for your vote to count as an entry. Which pizza will be the last one standing? Cast your vote (you can vote every 24 hours) so your favorite will be the winner. I’ve never bought a pizza from Papa Murphy’s that I didn’t like. I can honestly say that several pizza choices are my favorite pizza, it just all depends on what I’m in the mood for at the time. 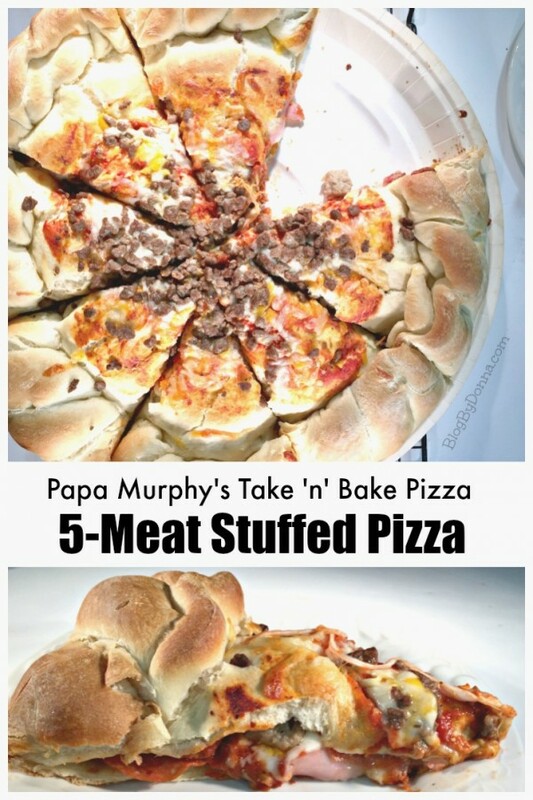 Papa Murphy’s is the world’s largest take and bake pizza chain. They pride themselves in providing only the freshest ingredients and making the dough fresh every day. You won’t find a freezer in their stores, either. Read more about the Papa Murphy’s story for yourself. 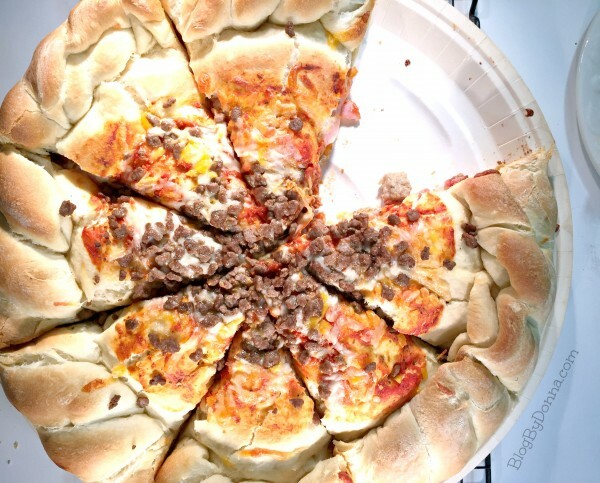 Papa Murphy’s offers a variety of pizza crusts, including pan pizza, gluten free, thin, original, and stuffed. I’m quite fond of thin crust pizza, but their stuffed crust is like no other crust I’ve eaten anywhere. Which pizza is your favorite Papa Murphy’s pizza? Note: Papa Murphy’s is not a certified gluten free kitchen. I want to try the CHicken Bacon Artichoke.